With breathtaking views of the Gulf, The Penthouse is a wonderful beach get-away. The top floor unit is approximately 1500 sq. ft. with two bedrooms, two baths and two floors of living space. The first level showcases an open living area with French doors leading out to the balcony that provides views of the beautiful Gulf. The first level also presents a guest bedroom with private bath and rear balcony. The second level features the master bedroom and bath with access to the spacious private terrace with spa and Gulf views. The unit features keyless entry/access, tile throughout, granite countertops, impact rated windows and doors, elegant interior design, televisions throughout the unit, wireless internet, washer and dryer, and reserved parking. There is no elevator in this building and about 40 stairs up to the unit. Take in the magnificent Gulf views while relaxing on your balcony during a lazy afternoon. Enjoy the sugar white sand and emerald green water just steps from your vacation retreat. Let yourself be immersed in all the splendor of the Emerald Coast. This was a very convenient location to all of the shops and restaurants on Main St., the green space for play and, most importantly, the beach. We even enjoyed getting to listen in on the live music at night. I will say there were a few nights when the noise from the street carried on a bit too late for us, but, generally, it was not a problem and really a small trade-off for the location. The interior was very clean and well-equipped. There were no stains or signs of wear on any of the upholstery or rugs. The bedding in the master bedroom was high quality, very comfortable. Sand toys, beach wagon and chair service were a nice plus. Echoing what others have said, the management was very friendly. After a couple of days, our hot water ran out almost immediately. She responded to our call promptly - on a Sunday and had the problem fixed very quickly. What a great location. This was the ideal spot for a week-long break with my family of four. We have vacationed in Rosemary Beach before, and we have enjoyed the places we have stayed..... but we ABSOLUTELY LOVED the Penthouse. Great views from all balconies!! So convenient to EVERYTHING!!! Plenty of room for all of us. We didn't want to leave! We will definitely be back. Beautiful penthouse in the perfect location!! My wife and I have stayed in this condo twice, and we're about to book our third trip. It is very spacious, always clean, and includes everything you need and more! 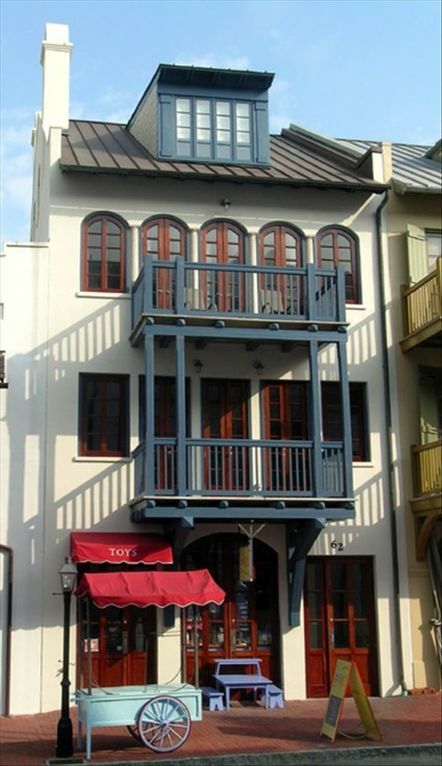 The location couldn't be better, right above Gigi's on Main Street which is in close proximity of all the shops and restaurants in Rosemary Beach. Not to mention, it's just steps away from the Western Green and walkway to the beach. Carrie and the rest of Soleil Management are amazing to work with. Extremely friendly and always available, if needed. Highly recommend this property and Soleil Management. We stayed here for a week this summer and did not want to leave. This property exceeded our expectations. It is just as great in person as it shows in the photos and descriptions. Our children are 8 and 10 and the location to the western green was wonderful. The green and the sweet shops are so close that the children could have some freedom. Something we all enjoy! The management went above and beyond to make sure we were satisfied. I would highly recommend this property for anyone who is able to manage a few flight of stairs - we loved the extra exercise! My family comes to Rosemary Beach several times a year, sometimes with a large group and sometimes with a small group. The Penthouse is simply the most perfect rental around...location, decor, amenities, customer service, view, and price. The location is right over Gigi's and so close to shopping and restaurants, the decor is comfortable and attractive, the amenities hot tub, designer kitchen, and rain shower, the customer service Jeanine is the best, the view cannot be beat from the porch to the rooftop deck, and the price is very affordable for the location and everything you receive. This is a rental that I HIGHLY recommend and is very comfortable for 5 to 6 people. Our family visits Rosemary Beach 1-2 times a year; however, this was our first time to stay in a Soleil property. We all agreed this property far exceeded all previous rented RB rental properties. From the initial inquiry to the deposit refund, (pre, during, post vacation) the Soleil Managment team was comitted to excellence. Our family cannot say enough good things about the Soleil property, the location, and the exceptional customer service that far exceeded our expectations. The Penthouse with gulf views was beautiful, comfortable, clean, spacious, and luxurious. Jeanine met us upon arrival, helped us unload, answered all our questions and presented us with the most luxurious welcome gifts: a beach bag, beach towels and a gift certificate to Patchoulis. We will be recommending this property to all friends and family members and are working on calendars to secure dates for our next stay at the Soleil Penthouse! Thanks, Jeanine for all you did on our behalf to make this Labor Day a dream family vacation! !